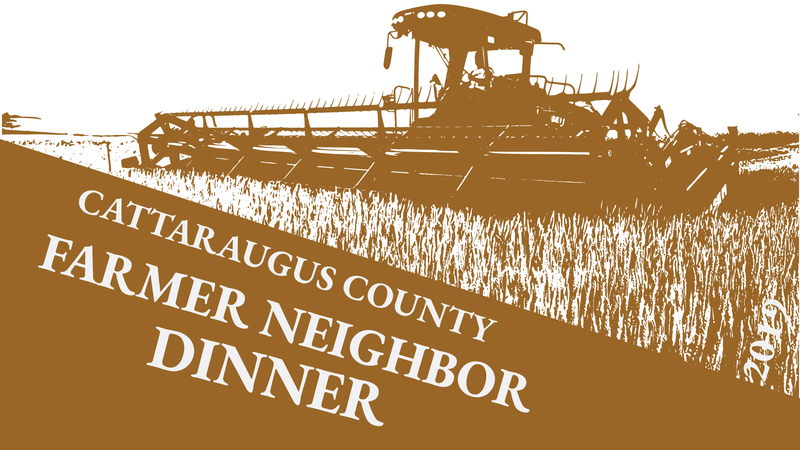 The Cattaraugus County Agricultural and Farmland Protection Board, along with the Cattaraugus County Department of Economic Development, Planning and Tourism, the Cattaraugus County Farm Bureau, the Cattaraugus County Soil and Water Conservation District and the Southern Tier West Regional Planning and Development Board will host the 8th Annual Cattaraugus County Farmer-Neighbor Dinner on Wednesday, April 10, 2019 at the West Valley Fire Hall, 9091 NY 240, West Valley, NY. Cattaraugus County is home to a vibrant and diverse agricultural industry. Good communication is essential to developing and maintaining good relationships between farm and non-farm neighbors. This event is a way to bring the County’s farmers and their neighbors together for a night of fellowship and understanding. It will also be a way for the County’s farmers and businesses to showcase what they have to offer each other. The dinner is prepared from all locally grown items from around Cattaraugus County and surrounding areas. At the 2018 dinner there were over 324 attendees and over 30 sponsors. or this post by Harvest_NY on Twitter. The evening will begin at 5:30 pm with agricultural related exhibitor displays and appetizers. Dinner will begin at 6:45 pm, followed by presentation of awards to Farm of the Year, Friend of Agriculture, Conservation Farm of the Year, and a surprise award. There will then be a presentation by Chris Baker, Director of Cattaraugus County Dept. of Emergency Services, and to close the event, there will be the door-prize raffles. Reservations for the dinner are due no later than Friday, March 22, 2019 and can be made by contacting Deb Miller at 716-938-2318 or by email at deborahmiller [at] cattco.org. Cost of the dinner is $20 per person and reservations must be made prior to the event. Also available are Agriculture Advocate Tables, purchase a full table (8 tickets) and be recognized in the event program. There are only 320 tickets available. Any organization that wishes to become a sponsor of the event or exhibitor should contact Deb Miller at 716-938-2318 or by email at deborahmiller [at] cattco.org.